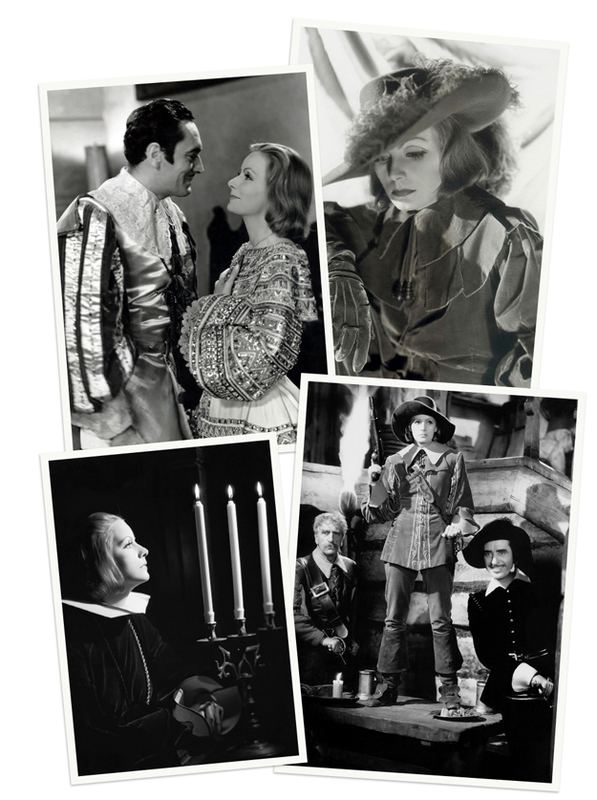 In Queen Christina, the Queen of Sweden (Great Garbo), dressed as a man to preserve her anonymity while out riding, meets the new Spanish envoy to her court, Don Antonio (John Gilbert). They're forced to share a room at an overcrowded inn during a snow storm. This is a pre-code film, so when Antonio discovers Christina's a woman, the two engage in a torrid love affair. What will happen when Antonio discovers she's a queen? I'll let you learn the answer for yourself. I adore this film so much. Paul bought it for me as part of the Garbo: The Signature Collection DVD set, which also includes a couple of my other all-time-favorite movies Ninotchka and Flesh and the Devil, as well as seven other fabulous Greta Garbo films. I whipped up a wintry Scandinavian menu to go with Queen Christina. It's hearty, simple food, like what might be served at a roadside inn during a snow storm. Enjoy! Put two plates in the oven and set to 170 degrees Fahrenheit. Melt 1 tablespoon of the butter in a large skillet over medium heat. When the foam subsides, add the ham and fry a few of minutes on each side, or until lightly browned. Remove the ham to the plates in the oven. Leave in the oven to keep warm. Add remaining tablespoon of butter to the skillet. Fry the onion slices until they are softened and transparent, about six to eight minutes. Add the apple slices and turn the heat down a bit. Cover the pan and cook, stirring occasionally, 5 minutes, or until apples are soft. Spoon the onions and apples over the ham and season with black pepper. Adapted from "Äppel-Fläsk" in Recipes: The Cooking of Scandinavia. Peel and wash the potatoes. Using the side of your box grater with the largest holes, grate the potatoes into a mixing bowl and stir in the chives, salt and pepper. Heat the butter and oil in a large skillet over high heat until foam subsides. Working with 1 tablespoon of potato mixture at a time, fry three or four pancakes at a time, flattening with a spatula. Fry 2 to 3 minutes per side until golden. You may need to turn heat down to medium-high to keep pancakes from burning. Adapted from "Rårakor med Gråslök" in Recipes: The Cooking of Scandinavia. In a small skillet or omelet pan, heat the butter over medium heat until it foams. When the foam subsides, add the onion and cook until onions are soft and translucent, but not browned, about 5 minutes. Turn down the heat, if necessary, to keep onion from browning. Add the mushrooms and cook another three to five minutes, or until lightly browned. Stir occasionally to prevent sticking. Add the breadcrumbs and stir to combine. Remove pan from the heat and gradually stir in sour cream and add salt to taste. Adapted from "Paistetut Sienet" in Recipes: The Cooking of Scandinavia. What a perfect winter meal! Ahh Garbo. What an actress. What an icon. Love this move. Sounds like a great meal! And who can go past a Greta Garbo film. Lauren, it is 7.45 am and I am in bed in London with the heated blanket on and my stomach is rumbling so loud you can probably hear it from there! I have never seen Queen Christina but I plan to. And when I do, I am going to attempt your menu. Oh yummy, yummy, yummy. I need to see this. Conquest was on TCM last night, and arresting as Garbo is, I couldn't get into it. Still haven't seen Conquest. I do like Charles Boyer, though. However, I think that Garbo's pre-code movies are the best (except I really love Ninotchka). Oh, you know how I love all things swedish! I'll have to try this dish-- and this movie! Pre-codes sounds good! I thought you might be tempted by a Queen Christina dinner! There are a lot of Swedish recipes I want to try, so I'm going to have to start watching more Swedish films. Queen Christina sounds terrific - and so does your Swedish menu! Sour cream and mushrooms are fabulous together. What a fun evening! 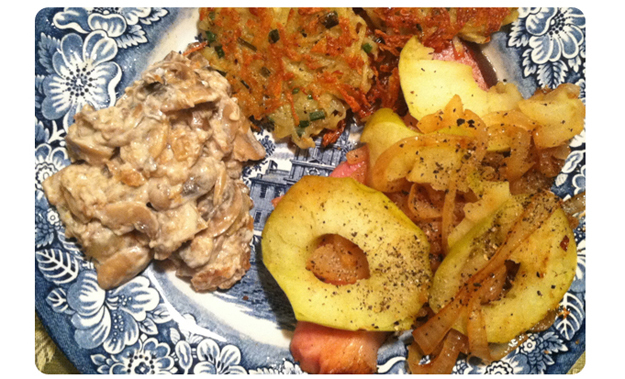 I love Scandinavian cooking and look forward to other recipes you discover. 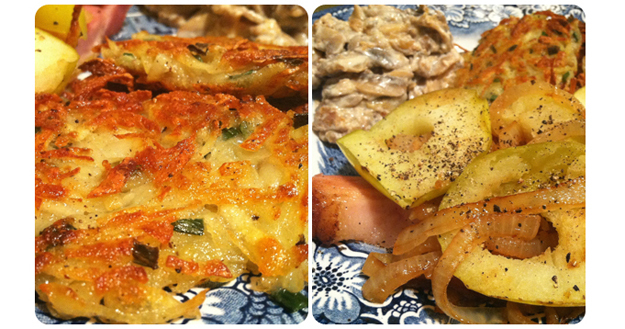 The potato pancakes sound wonderful!